Creative Products & Services Inc. Specializing in industrial and municipal filtration applications, Creative Products & Services Inc., is introducing the Bacti-Twist filtration system to many types of industrial manufacturing industries with multiple ways to benefit their process, whether it be used in polishing or filtering gases and liquids. Bacti-Twist innovative design is manufactured of PVC or HPDE with six different size ribbons to select from depending on your applications. The media is composed of continuous, free-moving layers of poly-ribbons. As pressure builds up on one layer, deposits move into the next layer – allowing for higher loads of substance to be contained for a longer process time and production run showing very minimum pressure differential between the media. Bacti-Twist is also designed for low and high pressure and flow rates. Its unique poly-ribbon design prevents particles from obstructing the flow, whether for up-flow, down-flow, vertical flow, trickling towers, reactors, and air, gas, liquid or chemical scrubbers. In most applications Bacti-Twist can be designed at a 5:1 ratio or more. For example: one cubic foot of Bacti-Twist weighs approximately 1lb and can accumulate 5lbs or more of substance. When this takes place, very minimum pressure drop will be experienced due the design of Bacti-Twist not being attached to itself This allows it to keep moving and creating longer process runs. 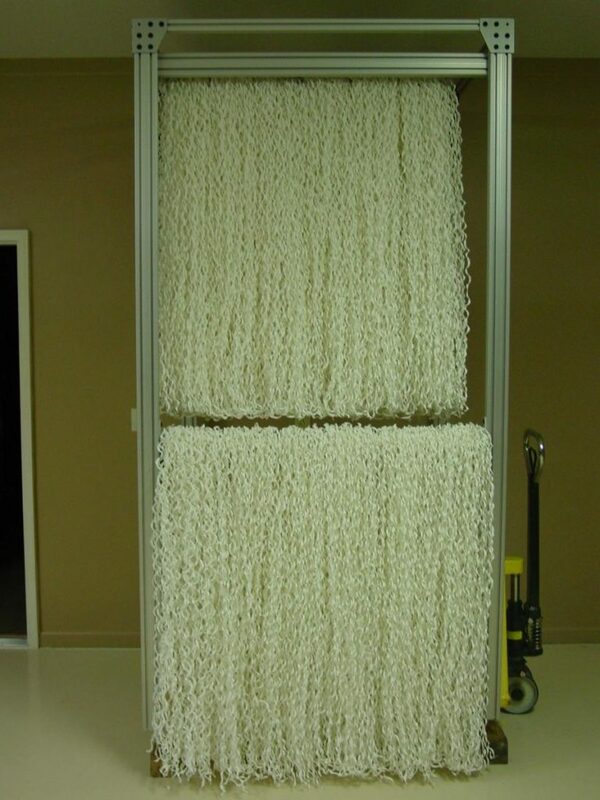 The Bacti-Twist can be housed in vertical racks or panels and can be custom fit for any shape, size tank or container. Bacti-Twist media is compliant with NSF ratings 51 and 61 for water/wastewater and food applications.